Scrub potatoes; prick several times with fork. Place potatoes on microwavable plate; microwave on High 8 minutes or until tender. In small microwavable bowl, place barbecue sauce with chicken; cover with microwavable paper towel. Microwave on High 2 minutes, stirring after 1 minute, until thoroughly heated. Split potatoes in half lengthwise; place on individual plates. 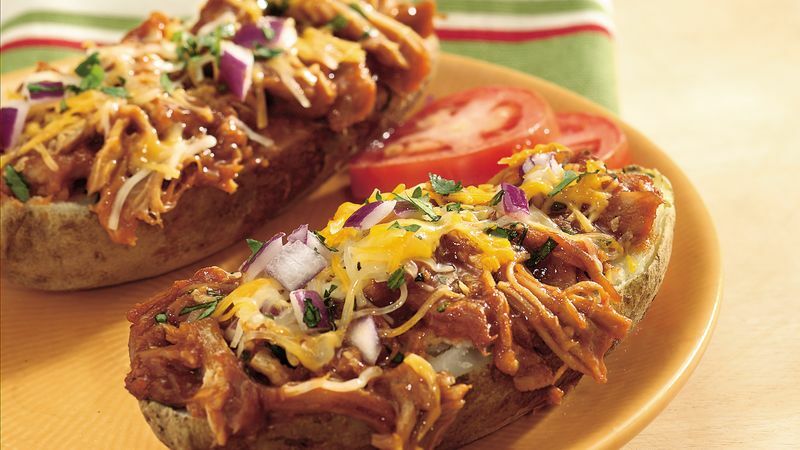 Top each with barbecue sauce with chicken, cheese, onion and cilantro. Replace the baked potato with a mound of mashed potatoes for another variation on this creative main dish. Use the remaining barbecue chicken for easy sandwiches. Serve them with pickles and potato chips.